Texas Ethics Commission - Time to Reboot? Control and reduce the cost of elections. Eliminate opportunities for undue influence over elections and government actions. 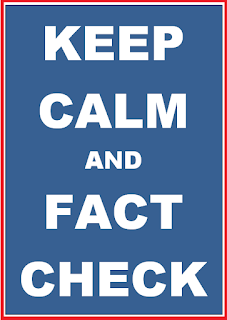 Disclose fully information related to expenditures and contributions for elections and for petitioning the government. Ensure the public’s confidence and trust in the government. And of course, the new system required new tax-funded staff positions to provide more robust training and enforcement. It sounded good at the time. The TEC using advanced technology to keep track of electronic filings by candidates made sense. After all, computers are great at mundane tasks such as making sure reports are filed on time and checking basic math. 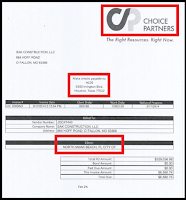 But, a closer look…a look at an actual candidate in 2016…shows TEC’s expensive new technology and staff are NOT catching even the most basic noncompliance issues. Thus, the TEC is NOT ensuring full disclosure of campaign finances. Elaine Palmer was elected Judge of the Harris Count 215th Civil District Court in 2012. She is currently running for re-election. She was on the ballot in both the 2016 Democrat Primary and the Democrat Primary Run-off. She won the run-off and is now on the 2016 General Election ballot. 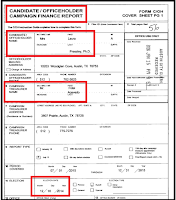 As a current office holder, and a currently opposed candidate, she is required by law to file numerous campaign financial reports by specific dates throughout the year. 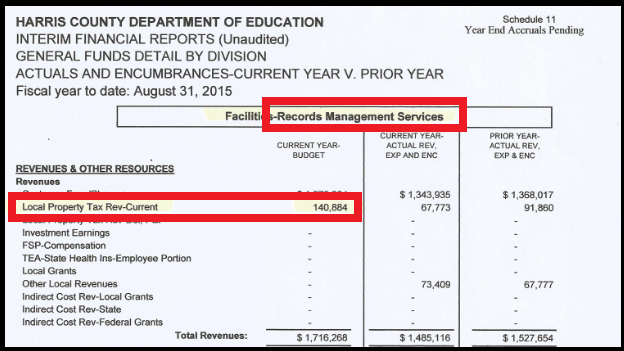 In July of 2015, Judge Palmer did not file her semi-annual report with the TEC. What did TEC do about it? In January of 2016, Judge Palmer did not file another semi-annual report with the TEC. What did TEC do about it? In February of 2016, Judge Palmer failed to file her “30 days before the Primary Election” report. What did TEC do about it? In February of 2016, Judge Palmer failed to file her “8 days before the Primary Election” report. What did TEC do about it? In May of 2016, Judge Palmer failed to file her “Run-off Election” report. What did TEC do about it? In July of 2016, Judge Palmer failed to file yet another semi-annual report. What did TEC do about it? Judge Palmer’s reporting issues don’t end there. 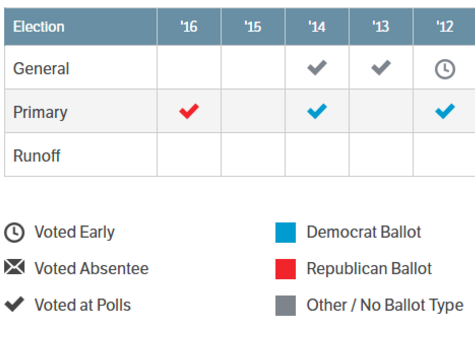 In September of 2016, six months after the primary election, Judge Palmer finally filed late reports going back to 2015. 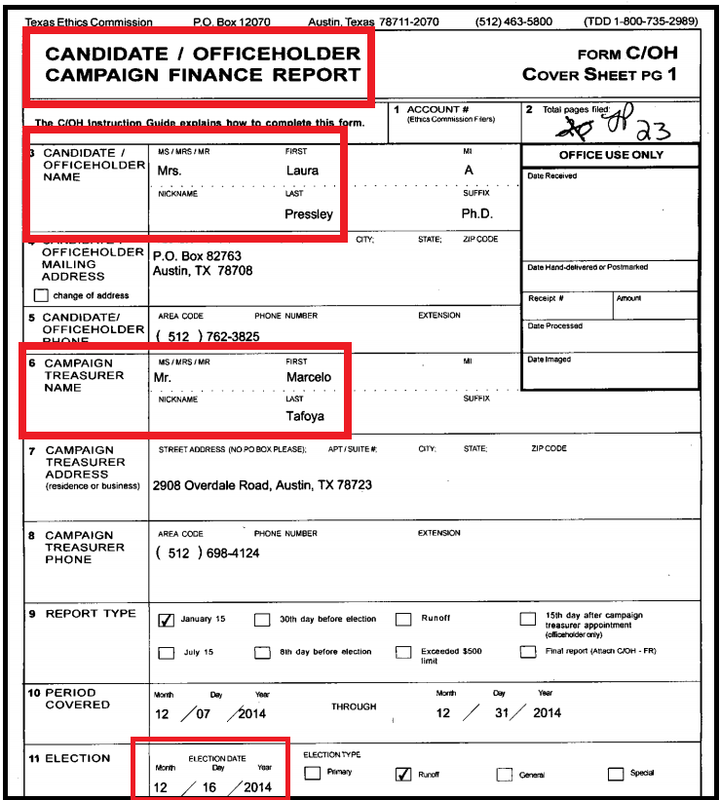 That’s right….a current officeholder…and currently opposed candidate…filed a “FINAL REPORT” ending her campaign reporting right in the middle of the General Election! 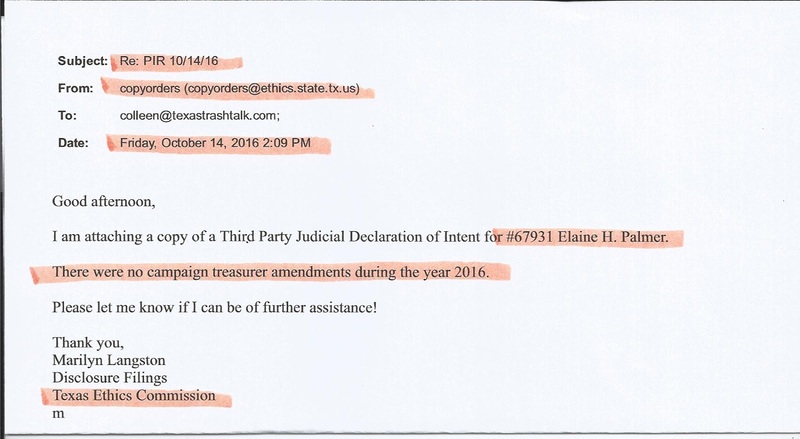 According to TEC records, since terminating her campaign treasurer on 5/14/16, Judge Palmer has still not filed a new treasurer appointment …. 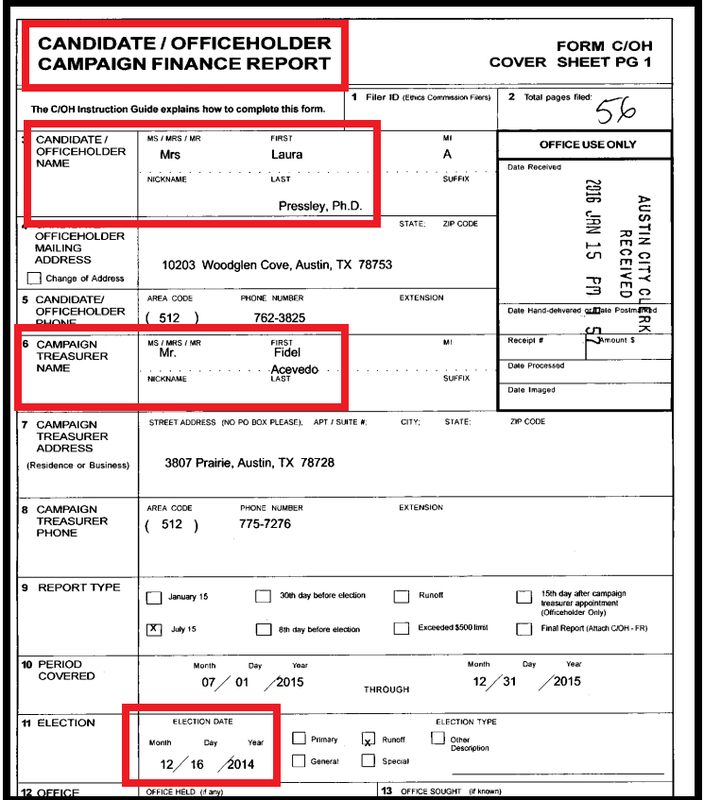 She has claimed over $26,000 in new campaign contributions, while continuing to list her terminated treasurer on her reports, and not having a current campaign treasurer appointment on file with the TEC. And that’s still not the end of Judge Palmer’s reporting issues. 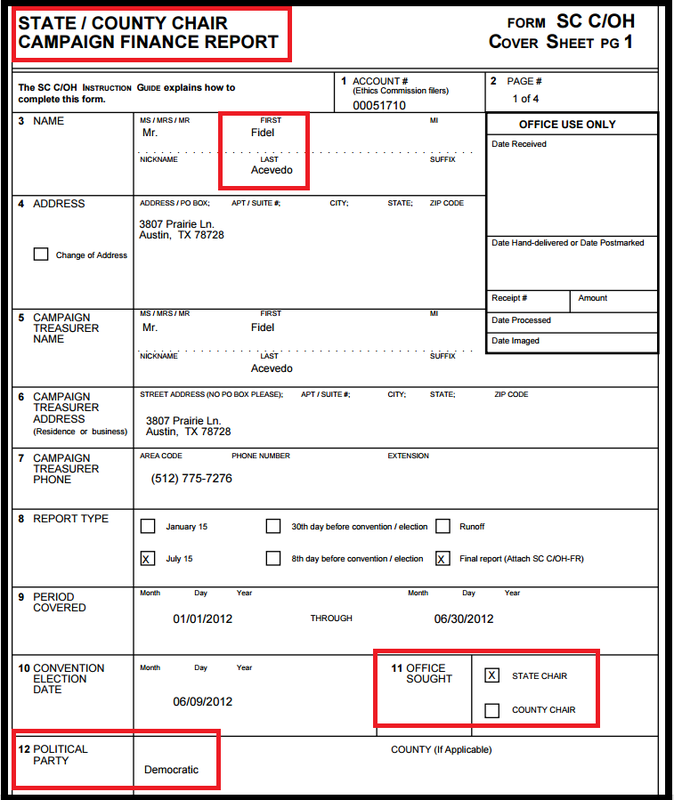 Two PACs reported Judge Elaine Palmer Campaign contributions to the TEC that Judge Palmer did NOT report. 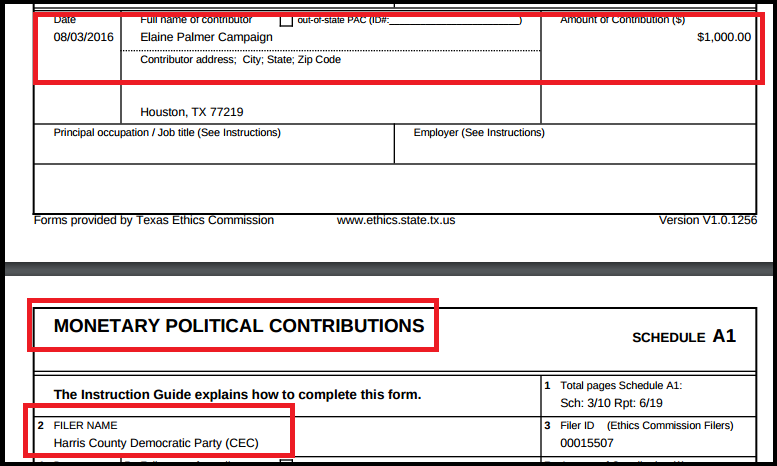 The Harris County Democrat Party reported receiving $1,000 from The Elaine Palmer Campaign on August 3, 2016. But Judge Palmer did not report that contribution on her campaign financial report. 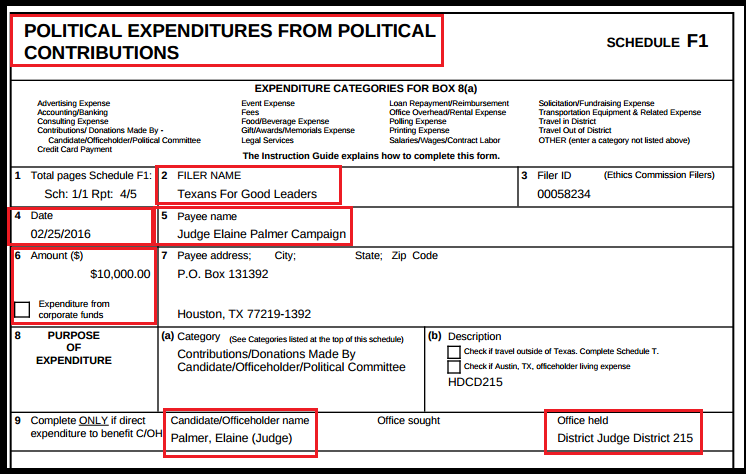 But Judge Palmer did not report receiving these three contributions totaling $16,000 on her campaign reports. And the math Judge Palmer used in her report covering 2/21/16 thru 5/14/16 doesn’t add up either. As a taxpayer, I find the lack of public disclosure being allowed by the TEC very disturbing. 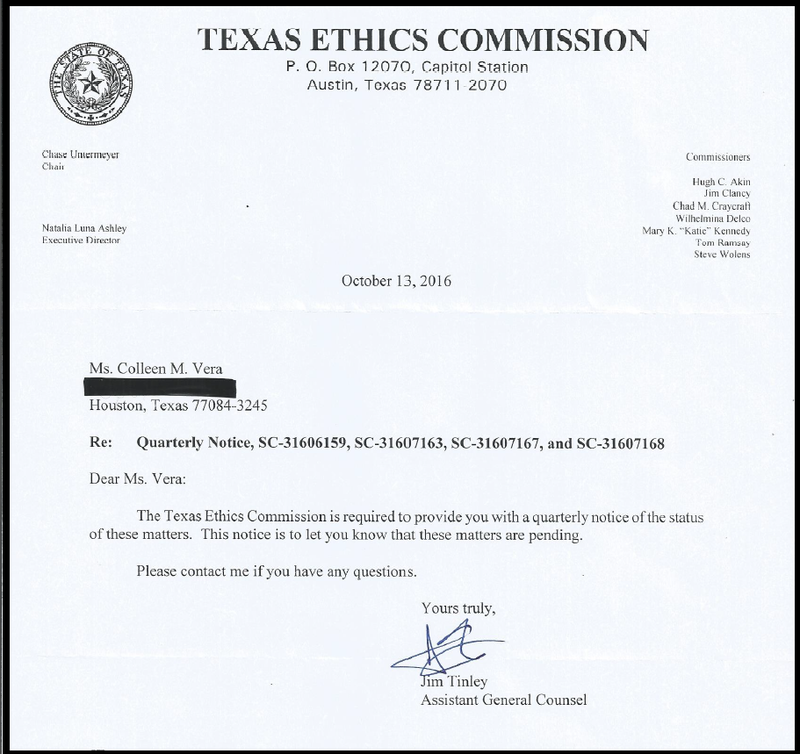 The TEC has been entrusted to ensure the public’s confidence in our government by ensuring full disclosure by candidates in Texas elections. 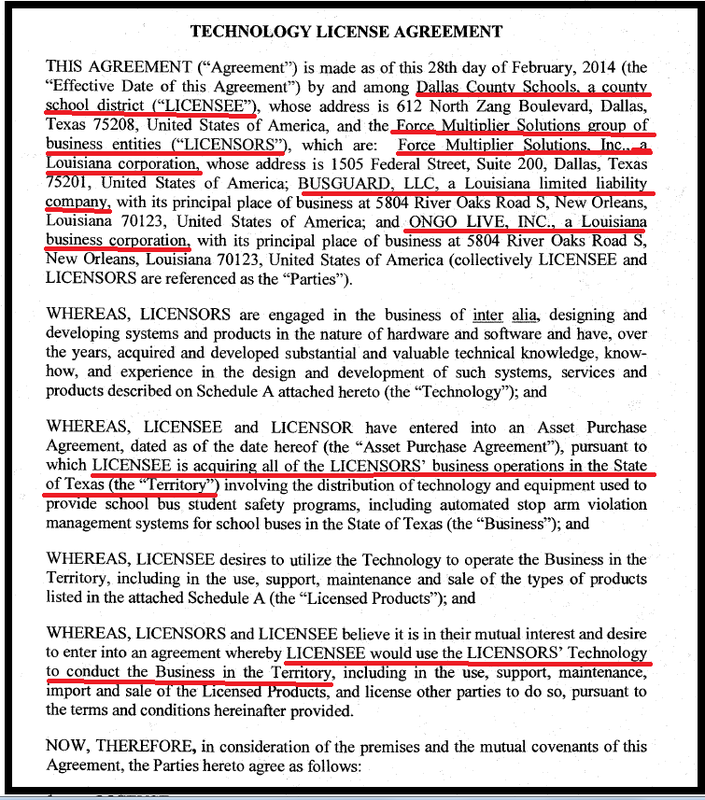 And the TEC does NOTHING…. .......ABSOLUTELY NOTHING…. to inform the voters. The TEC did not place Judge Palmer on their “delinquent filer” list in 2015 or 2016. ...even after I personally filed sworn complaints concerning Judge Palmer's lack of campaign reporting. 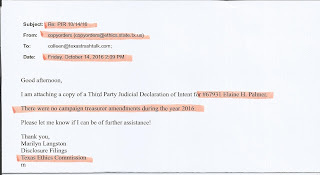 ...the fact that a candidate for the 215th District Civil Judge….a position which imposes penalties on others who do not live up to their responsibilities….completely ignores her own legal responsibilities in campaign reporting. 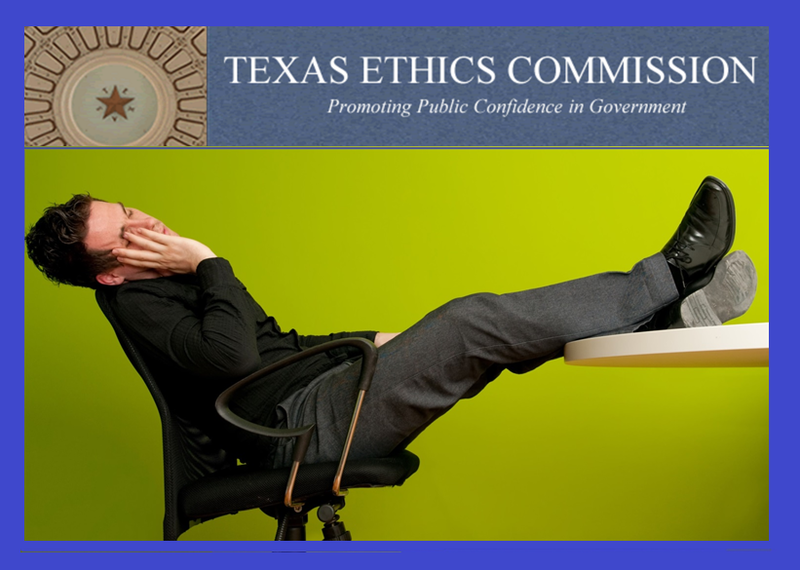 They will not have the facts because the Texas Ethics Commission is incapable of detecting simple, basic violations of campaign finance reporting laws….even with the newest technology and additional staff. As a taxpayer, it makes no sense to me for Texans to continue funding the TEC. We should cut our losses, admit the TEC is a complete failure, and turn the responsibility of ensuring complete and accurate campaign reporting over to someone who IS capable of doing this important job for Texas. Preferably a commission elected by the people of Texas. A commission which answers directly to us. So when they don't do their job, we can vote them out of office. 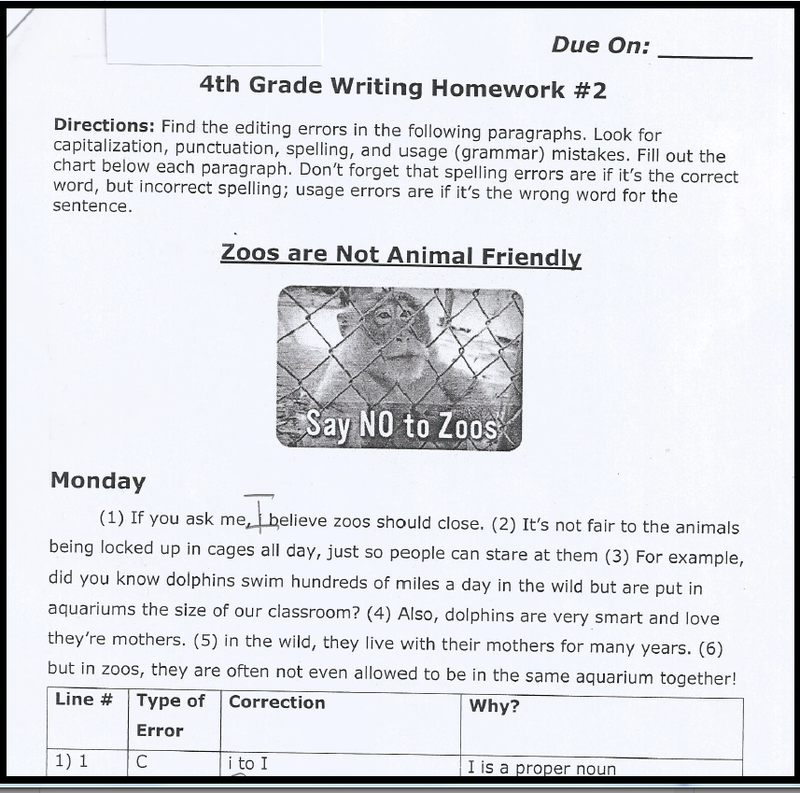 Why should Texas parents read their child’s homework assignments? 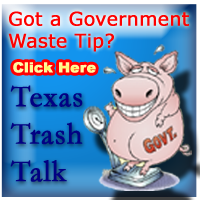 Just ask Harris County ESD9 Commissioner, Scott Debour. His 4th grade son, who attends Moore Elementary in Cy-Fair ISD, brought home this “writing” assignment yesterday. Simple enough…read a passage and find the errors in capitalization, punctuation, spelling and grammar. 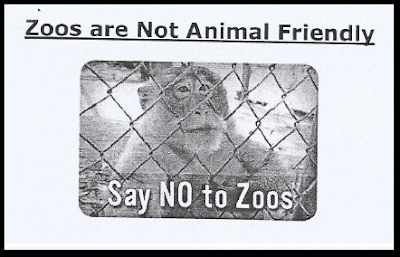 …and found “writing” being used to push the liberal animal rights agenda on his 4th grade son. Does Cy-Fair ISD really think the Houston Zoo, the closest zoo to Moore Elementary, is a horrible place for animals? Because most Houstonians would describe it as a wonderful zoo. …the zoo keepers work hard to keep the animals stimulated. The Houston Zoo also offer a variety of hands-on animal encounters for kids…Animal encounters which could never be matched with just a picture or film. What can Texas parents do? First, make an appointment with your child’s teacher to preview the materials which will be used this school year. If you find assignments you feel are inappropriate for you child, request an “alternate assignment.” One in which your child learns the same skills, without the left wing bias. Second, read the assignments your child brings home. If you still find issues, you can work your way up the chain of command – the school principal, curriculum director, superintendent, school board – but that could take months. If you want faster results, read the problematic lessons to the school board during public testimony at their monthly meetings. Then send the lessons to your State Representative and State Senator so they have examples of the left wing lessons being taught in Texas public schools. 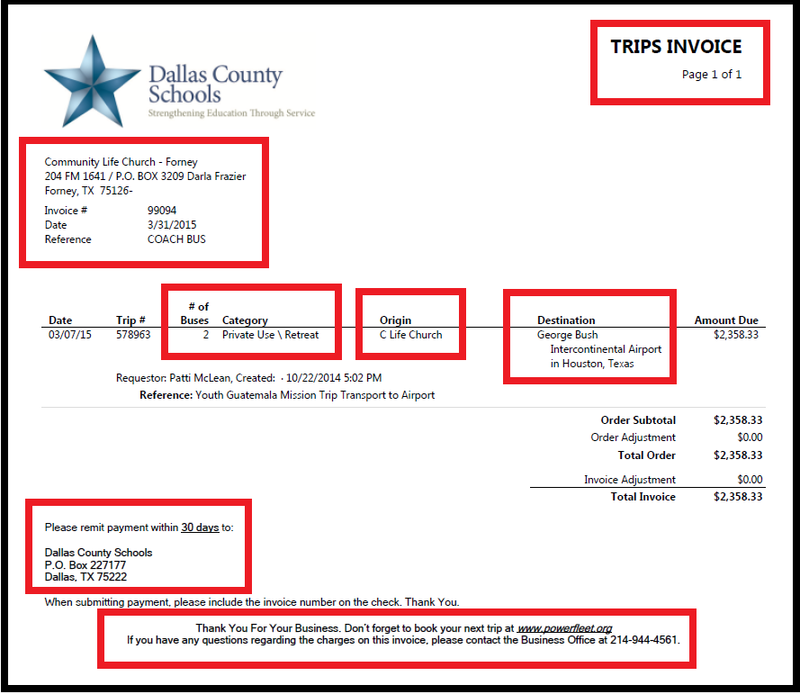 Since the video surfaced of HCDE’s superintendent outlining his battle plan AGAINST the taxpayers, Texans deserve to know exactly who declared war on them…. All other counties in Texas quit electing County School Trustees after all their students moved to Independent School Districts. But these two dinosaurs have refused to close. 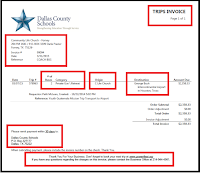 They continue to operate and tax under a loophole (TEC 11.301) even after the laws governing county schools were repealed in 1995. The archaic 1930s county school property tax they still collect is called the “equalization tax.“ It was supposed to be used for the public schools in the county. Instead, they use most of it for themselves. Why should the average Texan care? everything from cloud computing to charter bus services. They aren’t limiting these business enterprises to their own counties. They are selling “services” across the US. because both are actually leftover “county school districts”…. their 3000+ employees qualify for the Texas Teacher Retirement System. That means the State taxpayers are responsible for providing their employees LIFETIME benefits, as if they were teachers, even when their work has nothing to do with public education – like storing records for the City of Houston or chartering buses for church trips. If the Legislature allows these tax exempt subsidized business operations to continue, they will be sanctioning public debt to purchase private companies, and using public funds to supplement government owned businesses. 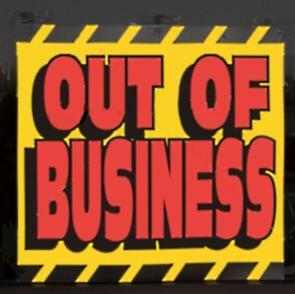 Government businesses which can put private sector companies out of business, and their private sector employees out of work. In other words, taxpayers are at war with subsidized public sector, socialistic businesses that are working to undermine our capitalist system. If you want to join in the battle, you can contact your Texas State Representative and Senator and let them know you expect them to support a bill to close the two remaining county school boards. 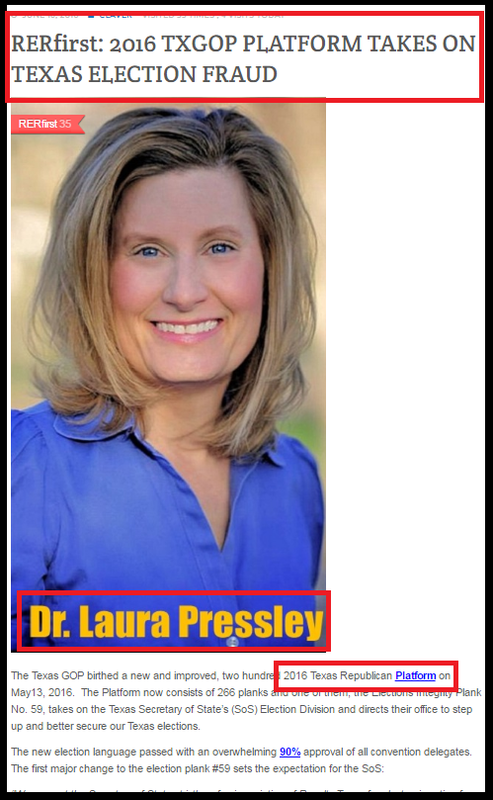 Dr. Laura Pressley has been making the rounds speaking to Texas conservative political clubs about her legal case against her opponent in the Austin City Council 2014 Runoff - claiming electronic voting corruption. As a former volunteer for True the Vote, an election worker, currently a Republican member of Harris County Early Voting Ballot Board, and an active citizen at the Texas Legislature working to improve our Texas Election Code, I went to hear her presentation, ready to take notes on improvements needed in our election processes. As I listened to her story and viewed her “evidence,” I realized that many of the claims and accusations she made were not consistent with my own experience working elections. So I explored a little deeper when I got home. I found so much evidence to refute her implications and allegations that I would need to write a book to cover it all. Because she changed her pleadings at least six times, it is too confusing to cover all her points. So I chose just five of her claims to offer a brief summary. I am not an attorney so I am including links to documents from her lawsuit so you can read all the details for yourself to make up your own mind. I am also including a very concerning “coincidence” that I found doing research on this case, because Texas conservatives deserve to know the WHOLE TRUTH. 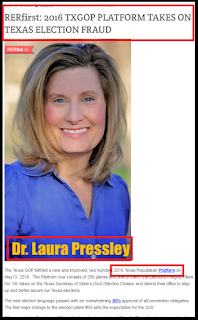 When I heard her speak, Pressley claimed to be a Republican Precinct Chair and Delegate to the 2016 Texas State GOP Convention. Both are TRUE. The Travis County GOP confirmed that she was appointed Chair of Precinct 140 to fill a vacancy on Feb. 9. She was a delegate at the 2016 Texas GOP Convention in Dallas. Pressley has a Democrat voting history. She voted in the Democrat Primary in both 2012 and 2014. Pressley’s campaign treasurer, Fidel Acevedo, is a strong Democrat. 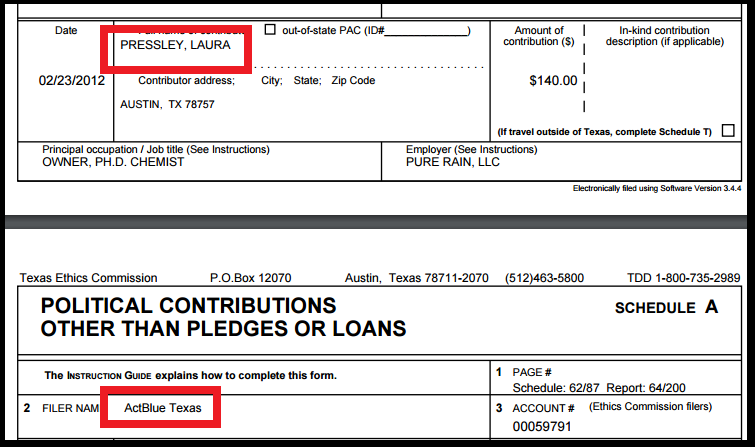 Pressley has made political donations to Democrats in both State and Federal elections. ActBlue Texas, and Capital Area Democrat Women. 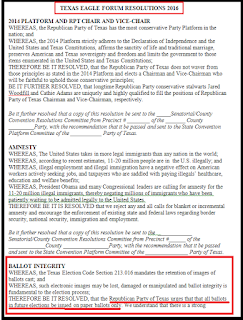 Texas Election Code (TEC) is divided into chapters, each covering a different election topic. In her talk, Pressley quotes Chapter 52 covering paper ballots and then applies the same requirements to electronic ballots. 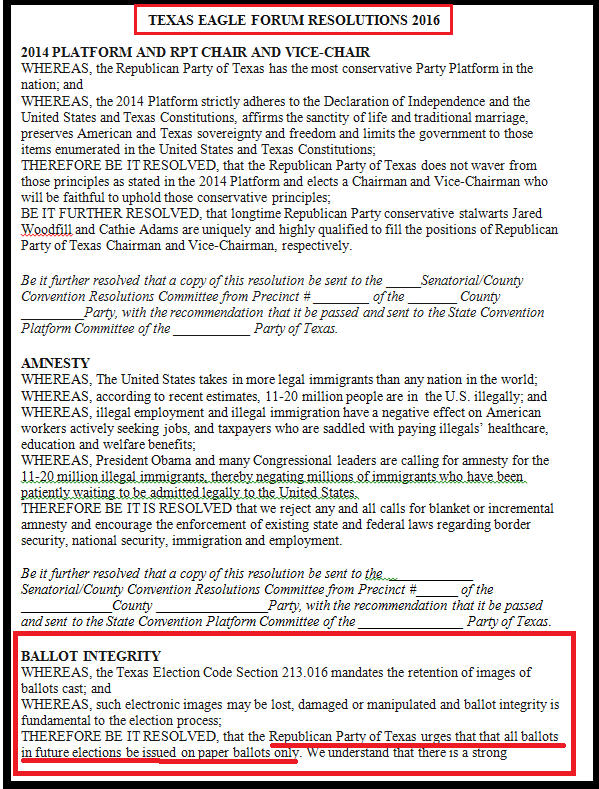 Pressley does not quote Chapter 124 covering electronic Voting System ballots or Chapter 129 covering Direct Recording Electronic (DRE) Voting Machines – the machines used in Harris and Travis Counties. She also does not quote the Texas Secretary of State (SOS), the chief election officer of the State of Texas, who is responsible for legal interpretations of election law. Pressley doesn’t argue that the machines are not recording votes cast. She argues that the printout of the voter record is not a legal “ballot image” because basically it doesn’t look the same as a paper ballot. The Texas SOS outlines the procedure for a recount from votes cast on electronic voting machines. Cast Vote Records (CVR), also called “ballot images,” are printed on paper – one per voter - then counted by hand. 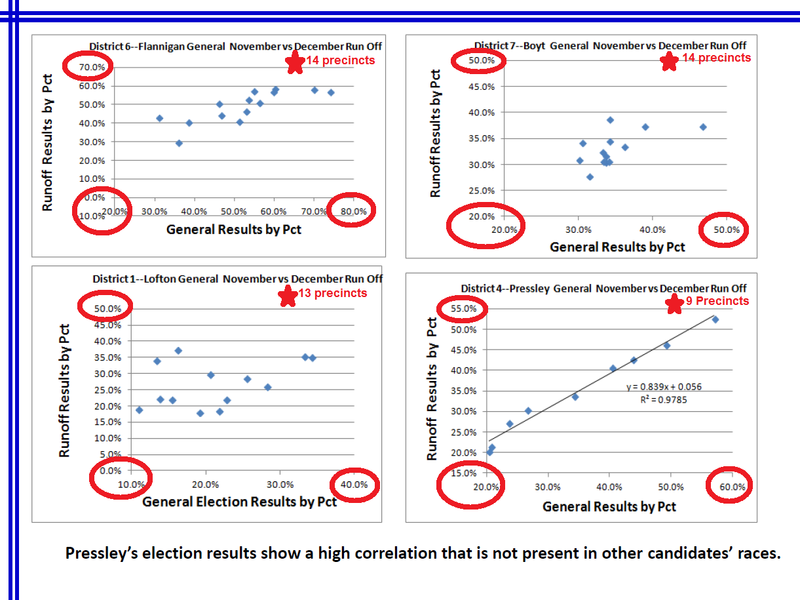 Court records show Pressley admitted she was present at her runoff re-count. She personally observed all (aprox. 4000) CVRs printed, sorted and re-counted. She also admitted that she had poll watchers present. She even admitted that the Secretary of State’s Office had an observer present. She also admitted that the Texas Secretary of State’s Office sent her a letter confirming their representative was present and that a legal recount did take place. Yet, Pressley still claims a legal recount did NOT take place because of the same argument she used in #2. She doesn’t feel the CVR is a legal “ballot image,” therefore the recount was not legal. She uses the same argument to claim in her talks that “4000 ballots are missing,” even though she witnessed about 4000 CVRs printed and re-counted. 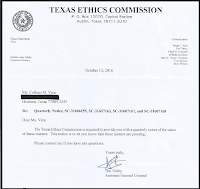 Court records also show Pressley refused to agree that she had received letters from the Texas Secretary of State, even when the letters were on Texas Secretary of State letterhead, because, as Pressley argued, the Texas Secretary of State didn’t actually write the letters herself. 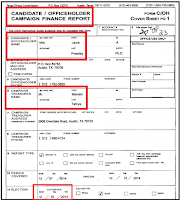 During elections, before the poll opens, “ZERO TAPES” are printed to show, by INDIVIDUAL PRECINCT, “0” votes for each candidate on the ballot. At the end of voting, Result Tapes are printed listing, by INDIVIDUAL PRECINCT, each candidate’s name and the number of votes each received. 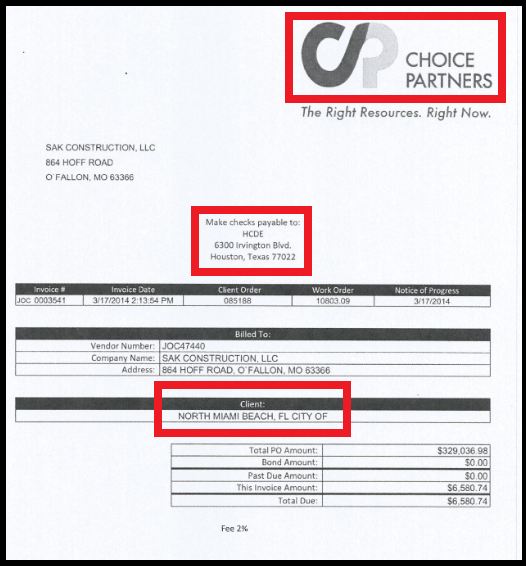 The image on the left shows the type of machine used in Harris and Travis Counties. The tape is similar to adding machine paper, only not as wide. Why a waiver? Because when voters are allowed to vote at any polling location, and all candidate totals are printed by INDIVIDUAL PRECINCT, it would take so long to print, it would not be a feasible process. 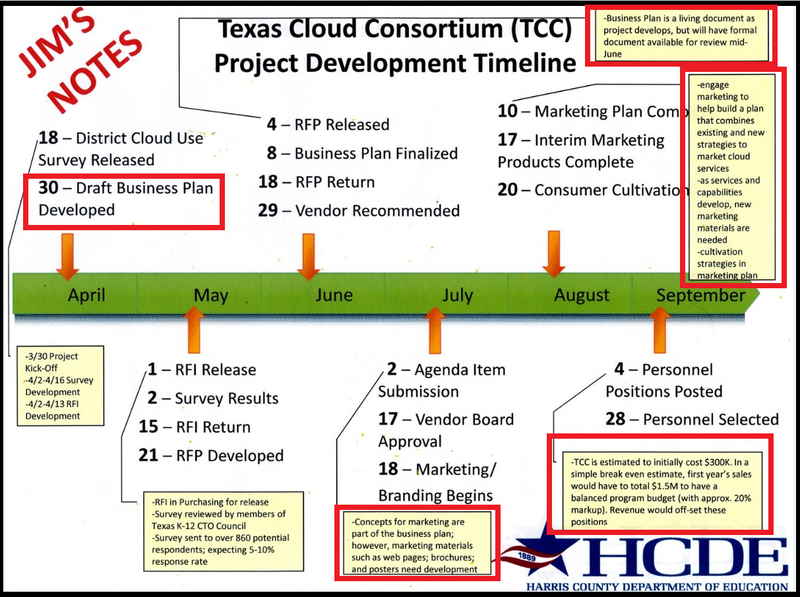 I will use Harris County’s 2014 General Election as an example…. There were 200+ different races or propositions on our ballot and we had 1,069 precincts. 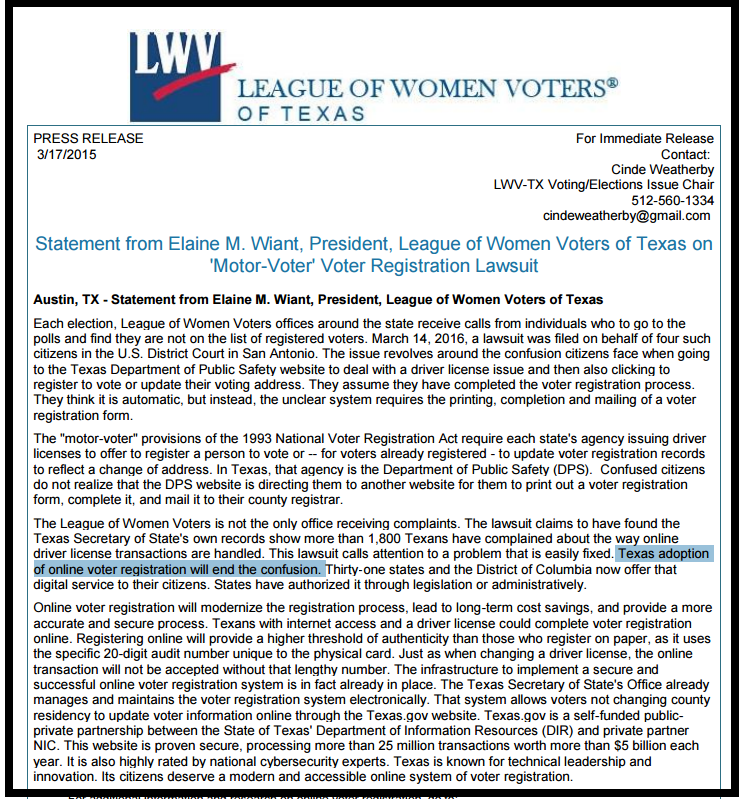 That is one reason WHY the SOS gives a waiver for printing full tapes ON SITE during Early Voting or when countywide polling locations (pilot program) are used. Instead, a limited tape is printed on site and the numbers are reconciled with the other election records. Zero and Result Tapes ARE produced, just in a different format and process. 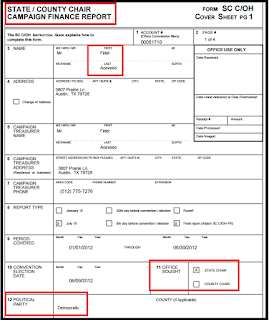 Court records show Travis County did produce Zero Tapes during Pressley's election. 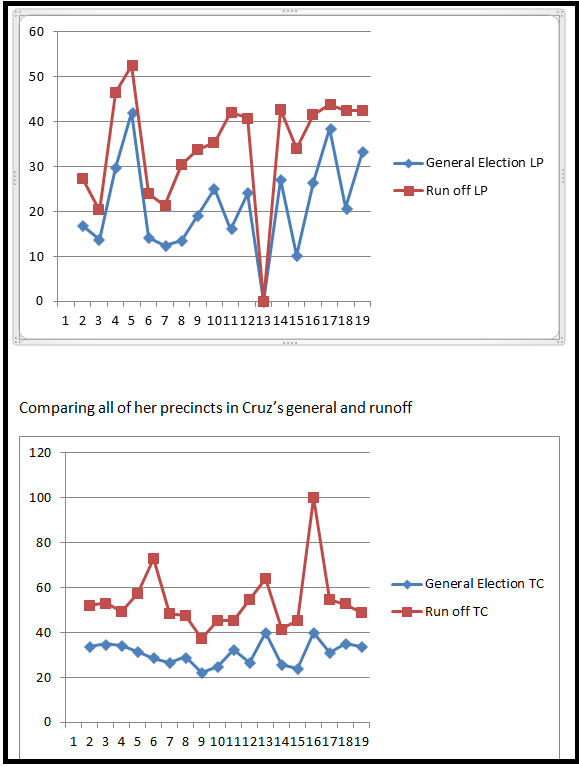 In her talk, Pressley showed the chart below on a large screen – as proof of corruption in her election. 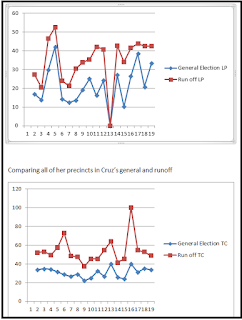 It charts the results of the general and runoff elections by candidate. 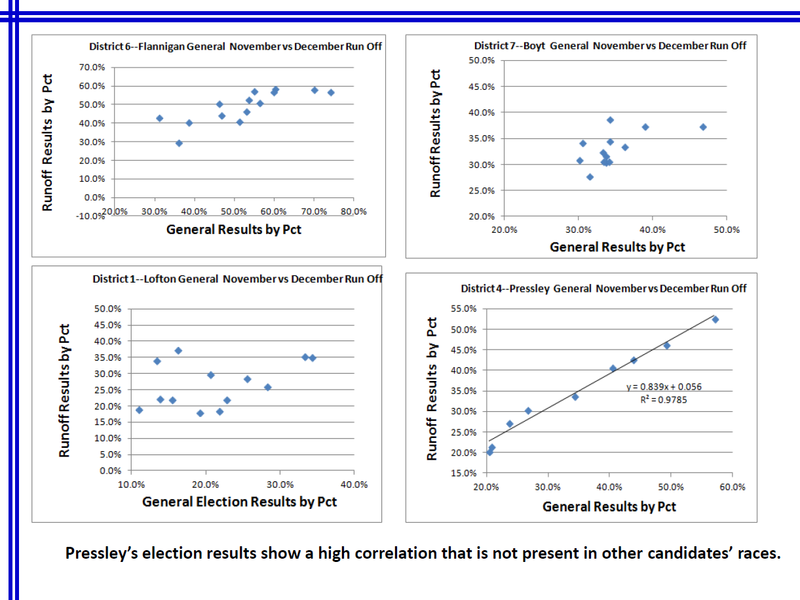 Pressley implies the straight line formed by her election results shows, mathematically, that someone tampered with her election. But, look at the chart more closely. There were 18 precincts which voted in Pressley’s District 4 City Council race. 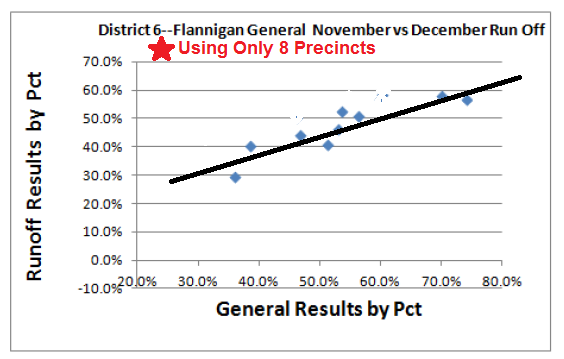 Pressley chose to use only HALF in her chart – just 9 precincts - to chart a straight line. Yet, she used different amounts in the other charts. 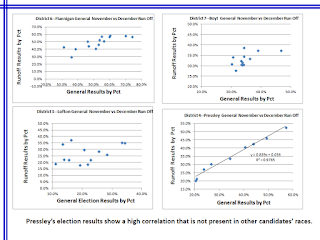 For REAL FACTS, to the left is the chart showing the results of ALL 18 precincts in Pressley’s race. 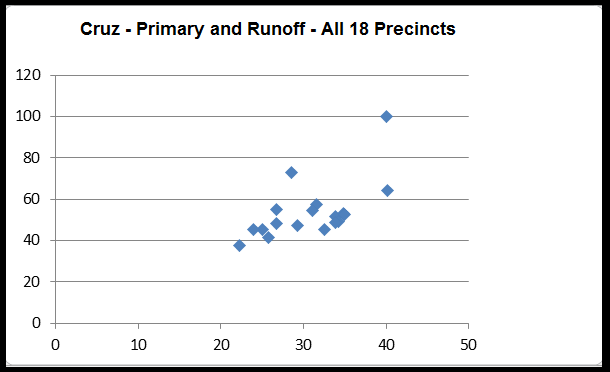 As an extra test, I plotted Ted Cruz’s Republican Primary and runoff races in 2012, using results from Pressley’s same 18 precincts. 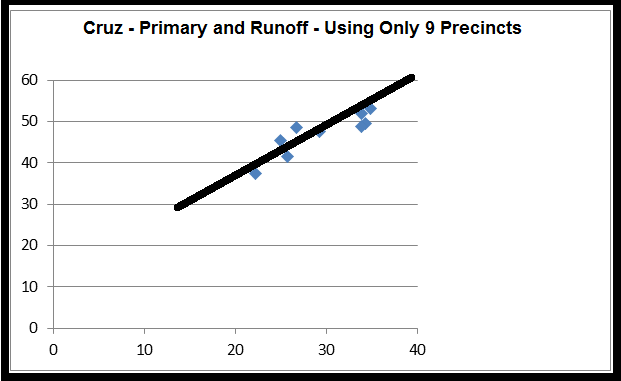 Then I chose just 9 precincts (as Pressley had done) and was able to chart a straight line. 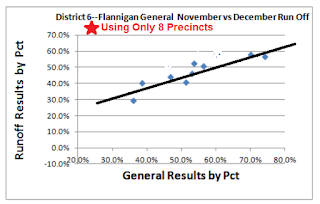 It seems to indicate a voting pattern from the voters in those precincts rather than fraud. On the left, is my final test. 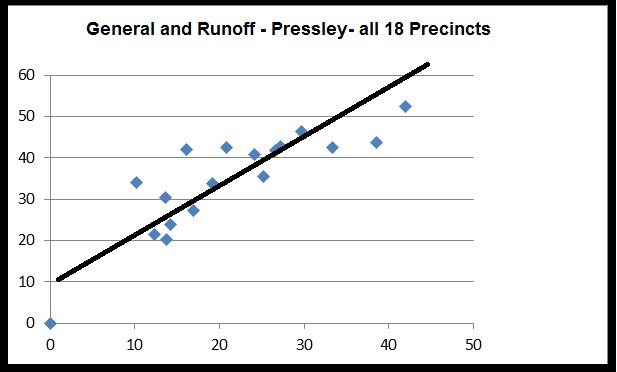 I charted the results of all of 18 precincts which voted in Pressley's race in a different format. 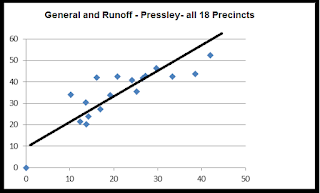 The top represents Pressley’s races in 2014. The bottom shows the same 18 precincts in Ted Cruz’s Races in 2012. Both display a consistent pattern with a couple of expected variations. No extreme variations. The judge didn't feel that Pressley produced the evidence needed to make her case of election corruption. I agree with the judge. 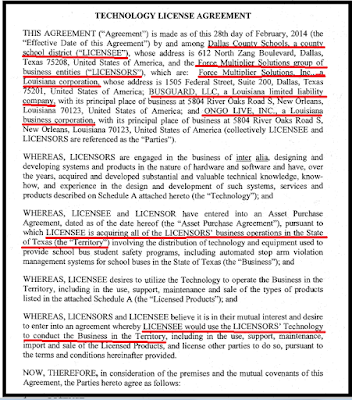 But you can read the court documents below and decide for yourself. "The case is really not about an election contest at all...it's really about that ballot image. It's really about her testimony, 'I prefer to have paper ballots.' That's why we are here. There's a place for them to go and it's the legislature. There's another place for them to go, the Secretary of State, and say, 'No, you need to stop this.' They don't do that. They come to court..."
Paper ballots + courts = liberal agenda. So I decided to dig a little deeper into Pressley's connections to the hand counted paper ballot people. Is Pressley’s push for paper ballots just a coincidence? Texas conservatives understand the importance of the November 2016 election. Not only to keep Texas RED, but to stop our runaway federal government. 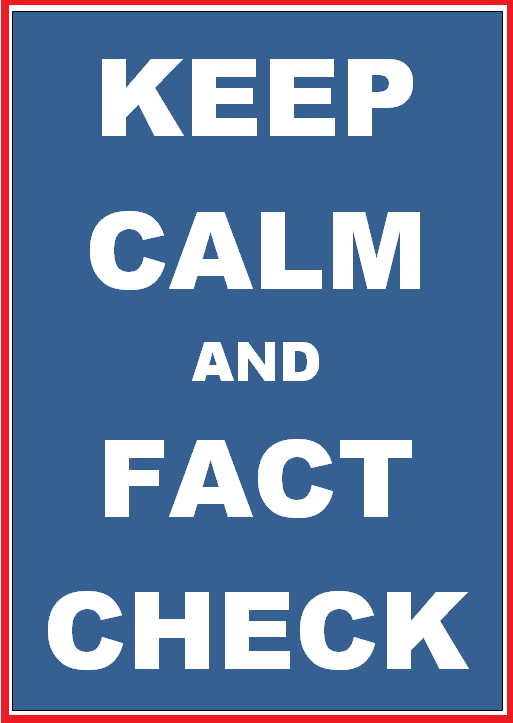 Liberals know it, too. They try to block strong conservative voting laws in the Legislature. When they fail, they go to the courts to block implementation. 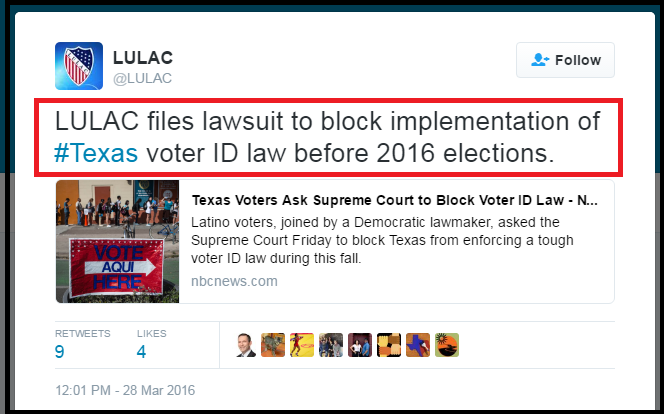 That is why the liberals have been trying to get the Federal courts to stop Photo ID for voting in Texas before the 2016 Election. The lawsuit, Texas NAACP v. Steen (consolidated with Veasey v. Perry) was filed by a group led by the NAACP. You can read more about it: here. Registering to vote online, without any proof of identity, makes it much easier for fraudulent voter registrations to be filed. 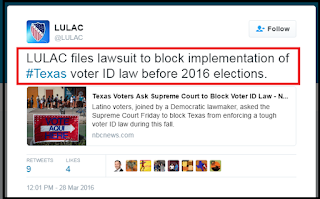 A lawsuit was filed in Federal court by the Texas Civil Right Project on 3/14/2016. You can read more about it: here. Stalin said it best. "It’s not who votes that counts,…it's who counts the votes!" That is why Liberals have had an organized effort to return Texas to paper ballots (hand counted at the precinct level) since 2003. In 2005, VoteRecue was organized in Austin focused on returning to hand-counted paper ballots. 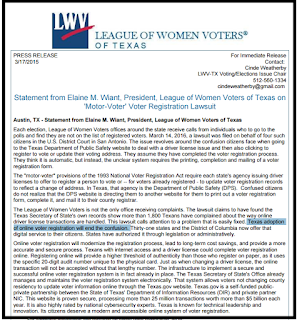 In 2006, the NAACP filed an unsuccessful lawsuit against our Texas electronic voting machines. The suit traveled through the courts until 2009. Also in 2006, VoteRescue members, Abbe Waldman DeLozier and Vickie Karp, wrote the book, "Hacked! High Tech Election Theft In America,” attacking the reliability of electronic voting. A group in Austin released their own “election study” calling for hand counted paper ballots. 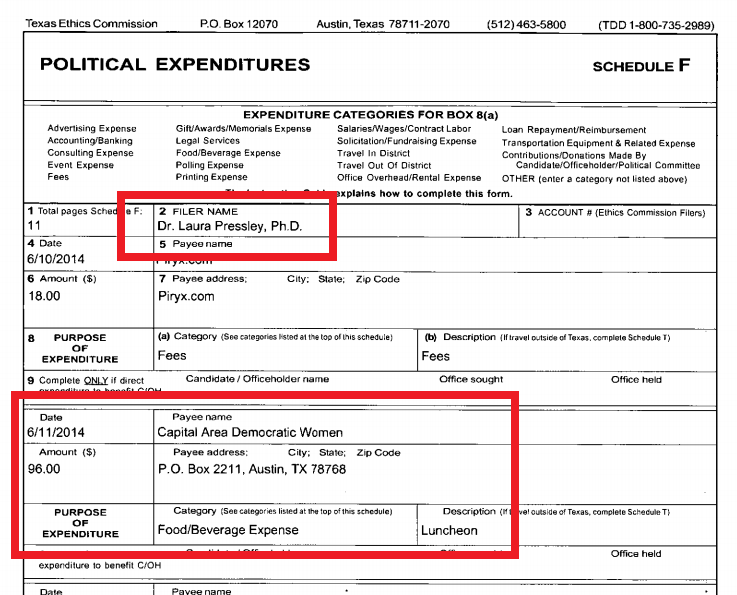 In 2014, Dr. Laura Pressley ran for office in Austin and consequently filed a lawsuit claiming she was harmed by electronic voting corruption in Travis County. "... previous challenges of that issue have failed for a lack of standing, and that a challenge by a defeated candidate 'who may have been harmed' by the process stands a better chance of being heard in court." Could it be just coincidence that….??? 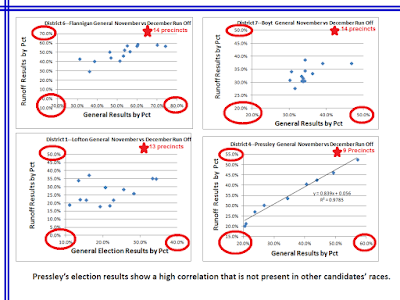 VoteRecue’s founder and members not only donated to Pressley’s campaign, they served as poll watchers for her recount. Pressley testified that Abbe Waldman Delozier (VoteRecue & Hacked…) is her “friend” and was present at Pressley’s deposition and court hearing. Pressley testified that her largest donor, Jenny Clark (VoteRescue), gave her “more than $10,000” for her lawsuit. Could it be just another coincidence that….??? Two champions of LULAC’s paper ballot resolution, Marcelo Tafoya and Fidel Acevedo, are BOTH currently serving as TREASURERS for Pressley’s campaign and lawsuit funds. Could it be simply more coincidence that….??? 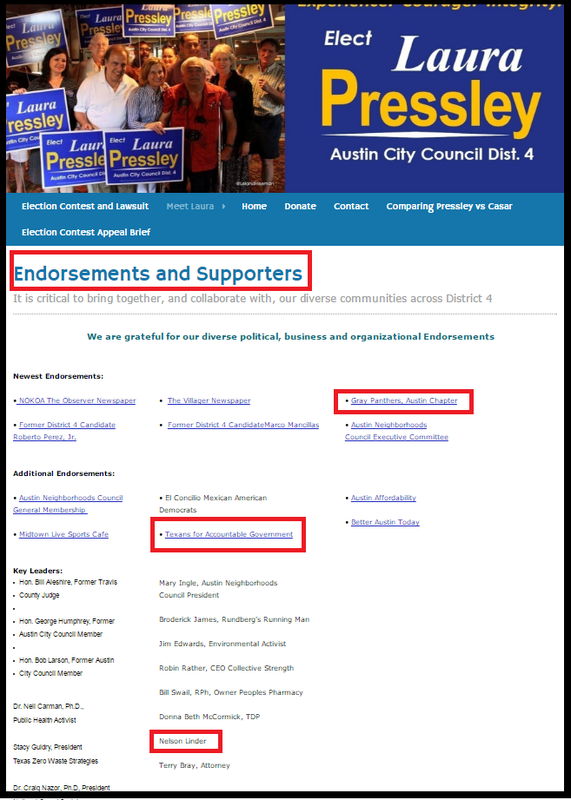 Nelson Linder, President of the NAACP Austin, who was a plaintiff in the 2006 lawsuit, was listed by Pressley as a “Key Leader” supporting her campaign….and on LinkedIn, Pressley lists herself as a member of Austin NAACP. Pressley served on a steering committee for Texans for Accountable Government (Texans for REAL Elections) and they endorsed her campaign. 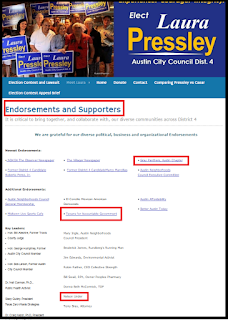 The Gray Panthers of Austin (Austin election study) endorsed Pressley’s campaign. Could it be even more coincidence that …??? And could it be just a remarkable coincidence that….??? 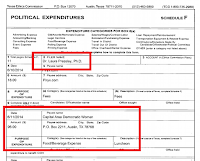 After voting in the Democrat Primary in 2012 and 2014, Pressley voted in the 2016 Republican Primary which qualified her to be a delegate to the Texas GOP Convention, where a good portion of her effort was spent attempting to get a “return to paper ballots” plank into the Texas GOP Platform. All just coincidence? You decide. As for me. I am a fan of Gibbs on NCIS.